Many proteins, especially growth factors and cytokines, when used as a reagent, degrade quickly, rapidly losing their bioactivity. This fragility hampers research and significantly limits the therapeutic potential of proteins. Development of a technology that can continuously replenish active protein from a local, microscopic store has been a significant challenge, but one that could transform the fields of cell culture and medicine by allowing greater control over the growth of cells. PODS® technology has made the goal of a micro-depot for proteins a reality. PODS® is a sustained release system which continuously replenishes proteins from millions of local microscopic stores which can be placed next to (or at a distance from) cells, either randomly or in precise locations. Just like cells, these micro-depots release a steady stream of bioactive protein. This protein can be limited to local surroundings or dispersed more widely, or made to form a gradient. At the heart of PODS® is an extraordinary polyhedrin protein. This specific polyhedrin protein has the unique ability to encase cargo proteins within perfect, transparent, cubic, micro-sized crystals, much smaller than the cells. These protein crystals form admixtures of the polyhedrin and cargo proteins which slowly degrade releasing the biologically active cargo protein. How can PODS® help my research? Culture method: For organoid formation, mouse embryonic stem cells (mESCs) were first cultured in optic vesicle medium and from day 9 transitioned to optic cup medium. PODS® growth factors were introduced to the culture system on day 20 by single addition of both PODS® BDNF and PODS® GDNF crystals. NOTE: During the 10-day period of PODS® growth factor treatment, only a single half media change was performed. Existing PODS® were kept in the culture and no new PODS® were added. Flow Cytometry: Organoids were dissociated from the petri dish and filtered through a 40 µm filter mesh. Subsequently, single cells were washed, stained with antibodies and analyzed on a MACSQuant Analyzer. (A) Quantification of total RGCs with the neuro-chemical marker RBPMS. RGC data plotted as percentage of total cell number (n=4). (B) Quantification of RGC sub-types. 3D-retinal organoids were cultured for 10 days either in the absence (left column) or presence of PODS® BDNF and PODS® GDNF crystals (right column). 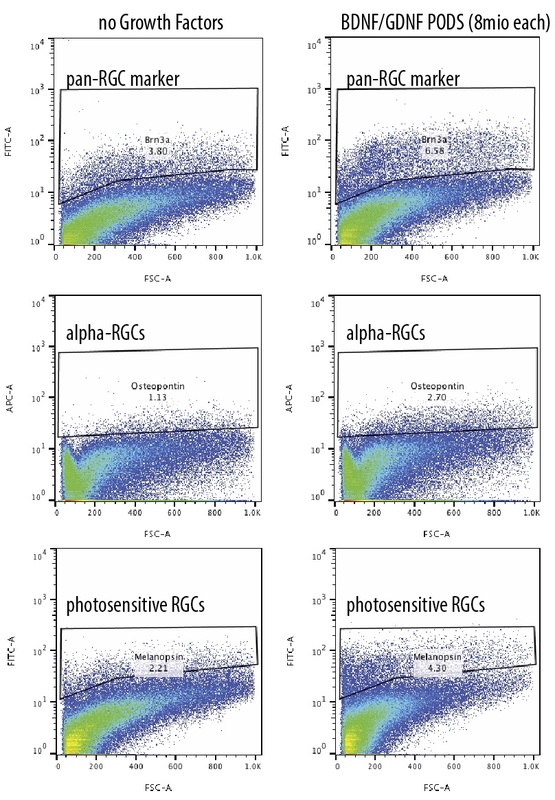 Subsequently, 3 commonly used cell markers were employed in fluorescence-activated cell sorting (FACS) to quantify the RGC sub-types produced. Analysis of FACS data shows yields of each cell subtype were increased as much as 2-fold by the addition of PODS® growth factors. Results are based on the single addition of 8 million crystals of each PODS® BDNF and PODS® GDNF throughout a 10-day culture duration. A half medium change of basal medium was performed after 5 days without further PODS® crystal supplement. 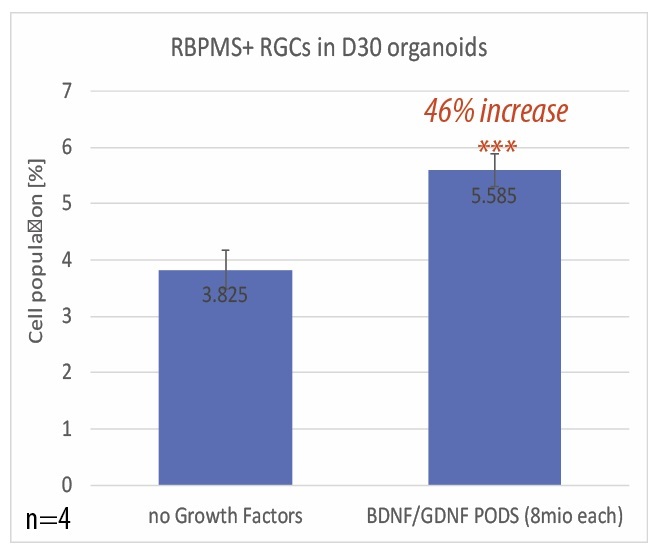 NOTE: An RGC increase approaching that achieved with PODS®, but using standard recombinant BDNF/GDNF, could only be achieved with medium supplemented with 250 ng of each GF which had to be added five times during the 10 day culture period. Organoids appeared healthier with smoother surfaces when incubated with PODS®. PODS® crystals adhere efficiently to plastic surfaces, ideal for the coating of tissue culture dishes. For long culture periods, a single application of PODS® crystals is effective, significantly reducing both hands-on time and cost of materials. PODS® achieve enhanced RGC yields compared to standard recombinant GFs with only a single addition throughout a 10-14 day culture period. For a full list of our current PODS® growth factors, please see here.